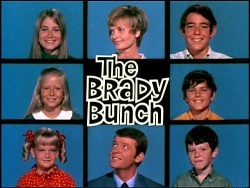 I grew up watching the Brady Bunch. Mike and Carol Brady are my first recollection of the “Blended Family.” Mike had three children from a previous marriage: Greg, Peter and Bobby (of course, they also had Tiger, the family dog.) Carol had three daughters from her previous marriage: Marsha, Jan and Cindy … the youngest one in curls. Although the concept may have been very progressive & I found the show very entertaining, I have my doubts about how representative or realistic it is of Blended Families that exist today. Also, what if Mike and Carol had more children after they were married? This new child would be the only common biological child to both parents. How would that have affected the family? “1. A family that is formed when separate families are united by marriage or other circumstance; a stepfamily. 2. Various kinship or nonkinship groups whose members reside together and assume traditional family roles” (Barker, 2003, p. 46). “…has a role structure in which at least one parent has been previously married and which includes children from one or both of these marriages” (Johnson, 2000, p. 119). how to accomplish the parents desires to treat children equally or unequally.